The large carpenter bee belongs to the family Apidae (Xylocopa spp.). There are seven species of carpenter bees in the United States. 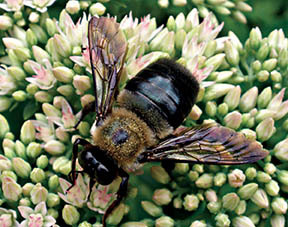 The eastern carpenter bee (Xylocopa virginica) is the most destructive. While a potentially destructive species, these bees are also effective pollinators of many crops and flowers. Adults are sometimes confused with bumblebees, but these bees are unaggressive and rarely sting. Carpenter bees are commonly known to bore into and damage wooden materials. These tunnels are the nesting sites where larval bees develop. Entrance holes are one-half inch (1.3 cm) in diameter and can be found in wooden structures. Infestations are first noted by the piles of fresh sawdust from the chewed wood from the tunnel. The tunnels go across the grain of the wood, then turn at right angles to go with the grain and extend for 4 to 6 inches. Once the tunnel is made, the bees fill the cells with pollen and regurgitated nectar and form it into a ball. Females lay eggs on the pollen and then wall off the cell with chewed wood pulp. They repeat the process until five or six cells are completed. Each cell is about 1 inch long. The pollen in the cells is the food that the larva uses to complete its development in about 36 days. The carpenter bees overwinter in old tunnels. Those that survive emerge in the spring and feed on nectar. Mating begins and continues until nesting or drilling begins. Bumblebees live in colonies, while carpenter bees are solitary, with only a single pair per tunnel. Bumblebees tend to be very aggressive when disturbed and will sting repeatedly. Carpenter bees are not aggressive and seldom sting unless caught in clothing, hair or the hands. The males tend to guard the tunnels and will hover in your face and buzz around your head. Because the male has no stinger, these actions are merely for show. The female, however, does have a very painful sting. 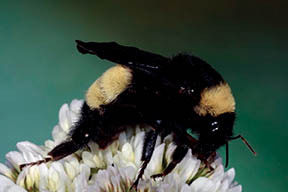 Bombus bee (bumblebee), B. Merle Shepard, Clemson University, Bugwood.org. Adult carpenter bee, Ansel Oommen, Bugwood.org. Carpenter bees have one generation per year. Adults are active in late summer, and larva will develop over winter. Applying an appropriate insecticide into the gallery will stop adults and control the emerging young when they develop. To allow the adult bees to make contact with the control material, do not seal the holes immediately after treating. A preventive treatment may be made using a borate formulation, such as Tim-bor or Bora-Care, on existing structures and using borate pressure-treated wood when building or replacing damaged wood. 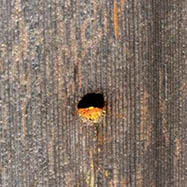 Carpenter bee hole, David L. Clement, University of Maryland, Bugwood.org. Larva chambers in wood USDA Forest Service, Wood Products Insect Lab, USDA Forest Service, Bugwood.org. D. K. Pollet and Ring, D. R. 2002. Carpenterbees. Bug Biz. Pub 2875. 2 pgs.